Actually, there was an earlier "pilot" (talking place well before Martin moves in with Frazier) that was available on Netflix. 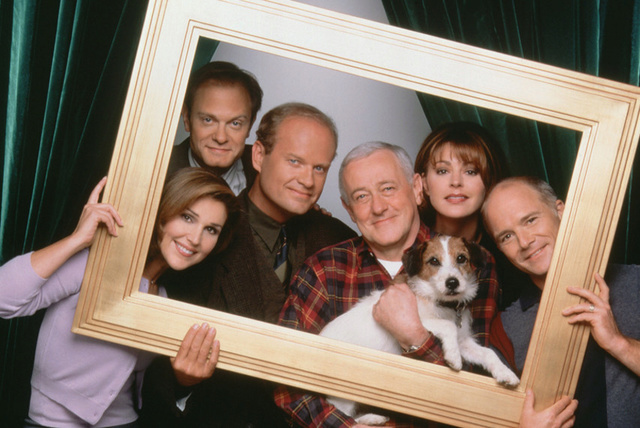 In that "pilot", because Frazier had put off seeing his father since moving back to Seattle, Niles tricks him into visiting Martin at his apartment so that all three can "spend time" together. After a brief show of concern, Niles departs and Frazier is left with a recently disabled, and irascible Martin. After several failed attempts to engineer a "connection" (hilarity and pathos ensued), Frazier achieves that connection by simply settling in with his father to watch TV and drink a beer. Great episode. I think what you're talking about is the last (24th) episode of the third season, You Can Go Home Again. It's a flashback episode and it corresponds to your description. Thanks so much for the info !! Really appreciate it. When I'm wrong...well, thats just normal.